One of the best thing about timepiece is that it can be a super universal gift for both men and women. But it also come along as a solid present, where consideration are necessary before buying one. Sometimes it requires some knowledge of basics stuff, while other time you just need a good taste of fashion and well-know the person, who will get your present. But to choose Fossil CE1010 Watch you really don’t need all these abilities I mentioned before. Almost everything about that clock I will try to submit at this review, because my wife was truly satisfied with that Christmas gift and I want to encourage other men to take action and cheer your ladies. First of all, watch comes in rounded metal box, what isn’t usual for me. Before this purchase, every watch for men’s I had bought were in plastic or cardboard box, so from the very beginning Fossil managed to surprise me. Just after unboxing the watch I released that in reality it looks much more gorgeously than in picture. The first thing that is caught by the eye is the bracelet. At the moment you take it, the feeling of ceramics fascinate you. I have heard someone saying that ceramic bracelet is not a competitor to the metal ones, because ceramic do not perform well with tension or torsion loads. But I think that is just a not justified opinion, because today watchmakers adopt ceramic with the latest technologies. That material are transformed into high endurance and scratch resistant bracelets. Ladies love thinness and lightness, exactly that is provided with that kind of bend. What is more import for some that ceramic does not cause any allergies, as some other metals. From this moment I won‘t even look at a timepiece with a metal bend, when I will be looking for another women’s watch. What can I say more about the bracelet itself, that the butterfly clasp on it is very comfortable and especially if you are using your hands on a keyboard every day then the low profile of the flat closing is very practical. Talking about the face/bezel, the hour markers are barely the same color as the background, but small details at the dial makes easier to see monolithic hour and minute hands. Even more it has another three dials, which are showing day of the week, day of the month and 24 hours standart time. Also in the top are clearly visible the brand. The main dial only have 12 hour marker, so in whole the face is not overcrowded. To sum up, the dial is substantial, which gives it a rich look. All surrounding are covered with small crystals, so at the same time timepieces is also a little fancy. Anyway, it fits perfectly with daily clothes, such as jeans. Lets have a look at the case. Because of weight, in hand it feels quite solid. 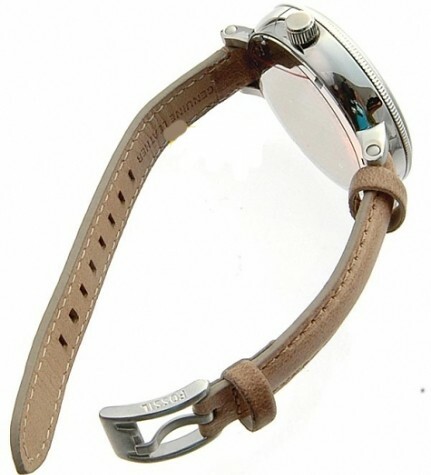 While wearing it on wrist, in first days you will definitely notice the case weight. In my personal opinion, that is good, because that gives you some confidence about the product. One more nice details is casing design, which encloses control pin and protect it in that way. The last feature to check is the price. For some this sum may seem quite big, but you need to understand that paying that kind of money you will definitely get a high quality product, which will also come with 11 year guarantee! 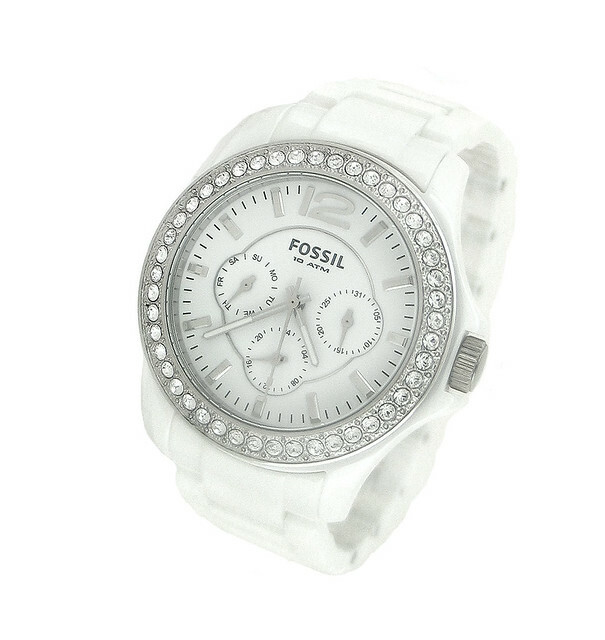 All in all, Fossil CE1010 Watch is perfect present for Christmas for your lady. I hope my recommendation helped and your purchase will make her happier. 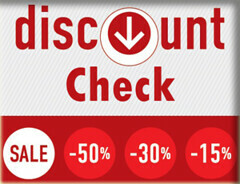 I would strongly recommend don’t wait for Christmas and grab one now for sure with 25% discount! By doing this review I realize that the beauty of this masterpriece can be seen only in real. I have some doubts about buying it for my mother, but I decide to give a try. The picture of it definitely won‘t show all the gorgeous and potential of this watch. This timepiece is the perfect way to stay punctual and also keep your style. 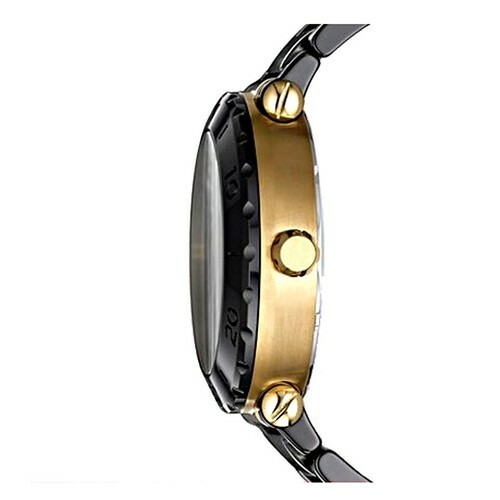 Black Ceramic and Gold Bracelet excellent fit to the wrist and make it wear even more comfortable than you can imagine. You can even forget that you having it, but time tracking will always remember you that. If you forget about it, you can be sure that other jealous ladies and guys will remind about that masterpiece on your wrist. What about this brand, until that day I hadn’t opportunity to familiarize with it, but by doing some research by asking others I didn’t heard any bad feedbacks, so I decide it would be a good chance to try it. At the moment I writing these lines I am not regretting buying it as a present for Mother’s day and by now I also can recommend this brand. Product comes in nice box and the e-shop were I bought packed it as a gift by my request! By the way, Fossil are offering 11 year warranty, that’s why company has emerged one of the most favorable players in this industry. Without fashion this timepiece also has all the necessary functions. You shouldn’t fear about water when you are at the beach, because this brand has water resistance up to 330 feets, what is quite a lot, when you imagine that depth. And yes, this watch truly suit when you are resting in the nature. Its not too elegant and not too sporty, so it looks very well with ordinary clothes, such as jeans. But keep in mind that it is quit a good choice like a accessory for going out or going to a date. To sum up you can wear it for any occasion. 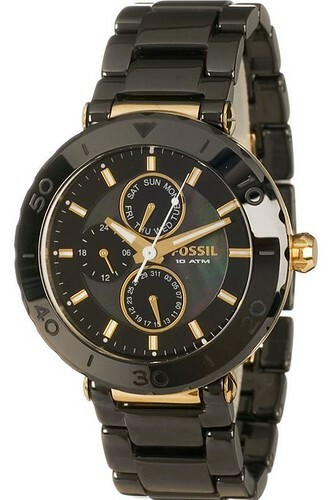 Every man will notice Fossil CE1005 model on your wrist and you definitely will get compliments. I guarantee you that! Even by getting home at late night you will see the time, because watch has luminous indicators. Without time, it also shows date, what is quite important for me, when I am choosing which watch to buy. The timepiece feels solid and expensive. 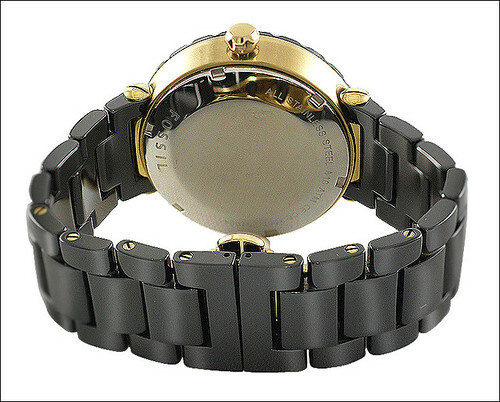 The case of it is made from Stainless steel and as I said before it has reliable ceramic bracelet. The case diameter is also quit big – about 40 millimeters, so ladies, who love that size of watches – don‘t wait any more and get this as fast as possible. Who didn’t like, you can just try it, if it still not look great for you, you can always return the product and get back the money. 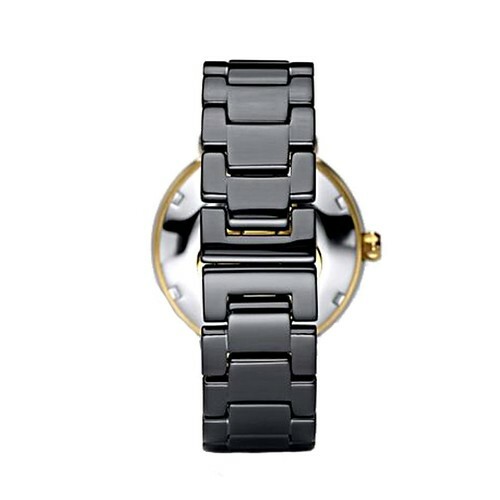 Some e-shops has this posted as a black watch, but some say it is more like a gun metal color. Anyway Fossil creates modern yet vintage products for everyone. 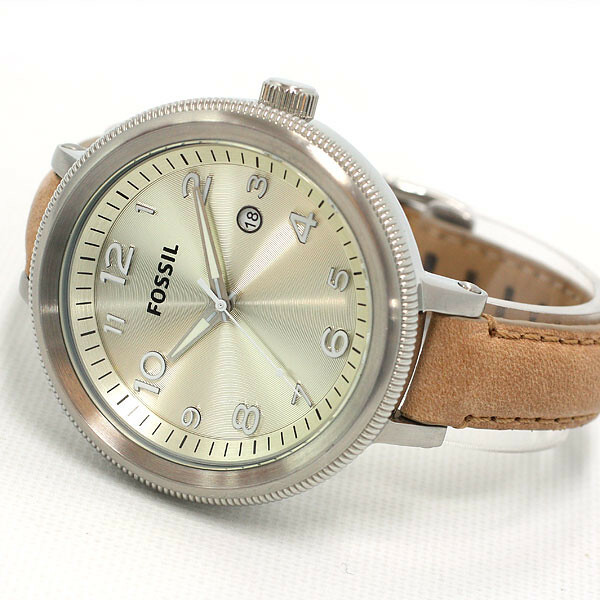 If you didn‘t know, while the majority of designs are created via in-house clothiers, Fossil has reached out to such latest artisans as product clothier Philip Starck and famed architect of the Guggenheim Museum in Bilbao (Spain) to make uniquely brand new timepieces. The movement of clock is Analog-Quartz and for my situation it works perfectly. I didn‘t manage to find anyone, who would told me, that this particular timepiece would work disorderly. Other reviews also have a good opinion about this. Talking about the price it is worth every cent and dollar. For that kind of clock with ceramic bracelet and great movement it is a very, very reasonable cost. Other even might think that you had to paid a big amount of money, so generally you will make a good impression. For a final word I could say that Fossil CE1005 was a great choise as a present for Mother’s day. I would strongly recommend don’t wait for Mother’s day and grab one now for sure with $40 discount!